Because of its low cost and accuracy, this test is ideal for testing family members, employees, and school students. Bring the pouch to room temperature prior to opening. Remove the test card from the sealed pouch and remove the cap. Read results in 5 minutes. After more than 10 minutes results may not be valid. Positive: One colored line appears in the control (C) region and NO color band appears in the (T) test region. A positive result indicates that the drug concentration exceeds the cut-off level. 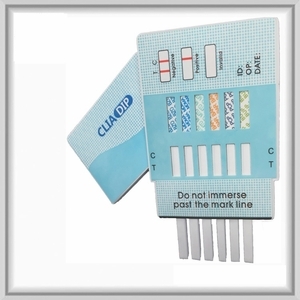 The One Step 12 Drugs Dip Panel test is one of our most cost-effective urine drug testing kits�just dip the drug test kit and read the results for 12 drugs groups in seconds. This tests is also known as Construction Panel Theme Card, because when they need to hire new employees for big construction contracts, it's far better to exclude drug addicts. The flat design of the test kit enables you to scan or photocopied the test result for record keeping. For laboratory confirmation of positive results you can send the specimen, along with chain of custody form, into our drug screening laboratory facility...separate purchase required.